Wet Plate Day 2010, it's official. For now you can download the promotional poster here (this saves me data traffic on the wetplateday-website). Spread the word and have fun. 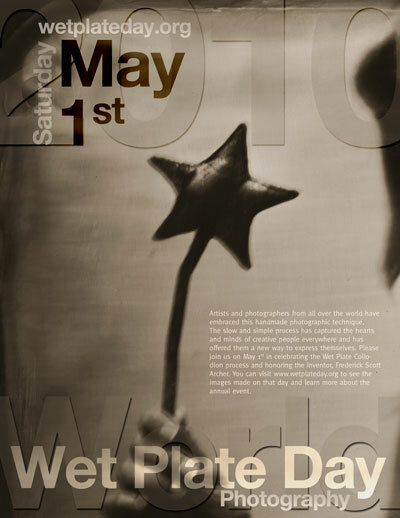 Oh my, I look forward to participating in my first Wet Plate Day. I like the star ... and I like the whole plate it came from :) Nice work Heyda and DavidJohn! I like the graphic design. and the Nice work. Tucson is ready! Sorta.... I didn't get as big a thing going as I'd planned, but we'll shoot over at Mark's house, and I have at least one model lined up. I assume you are going to allow uploads for this year's batch again Geert-Jan? Let me know if you want help doing the admin on it again. As far as loading pictures last year we didn't have any time restriction, at least for a few weeks. I'm in for sure. Looking forward to a (hopefully) rewarding day. Thank you Garret, this year no Scotland for me. We are at home. I don't expect any troubles so I think I'll manage on my own. As for last date for entries: The deadline for the book, probably. Looking good! I already posted it on my blog some time ago. I'll make another post before I leave for London this Saturday. But great job and thanx for doing this! What will the max file SIZE in dimensions ? You don't take a picture, it's given to you. No limits here. Whatever you can squeeze in 250kb filesize at acceptable quality for web (72 ppi). For the book is a different matter. But thats not my department. I don't know the specs on that one. I'll be leading a WP workshop in Philadelphia on the first and second. Exciting to be spreading the word on the big day. Hopefully I'll have something to contribute. Anybody in town... come on down. Life kind of sucked me in and pulled me away from the dark arts. BUT, this has pulled me back in. I got my chems ready, now I need to set up the dark box. I think my last session was last july......whewwww.....how time flies. now if I can just get the 8 yr old to stand still.....lol! I'm going back for more! Collodion on Aluminum Diptych "Receptacles"